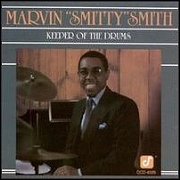 This recording is called Keeper Of The Drums to underscore Marvin "Smitty" Smith's ability to carry on a tradition associated with such drummer-bandleaders as Art Blakey, Max Roach, Philly Joe Jones, Tony Williams, and Jack De Johnette. Smitty's leadership abilities are evident in the choice of musicians: trumpeter Wallace Roney, saxophonists Steve Coleman and Ralph Moore, trombonist Robin Eubanks, pianist Mulgrew Miller, and bassist Lonnie Plaxico are among the most gifted voices in a thriving new generation of jazz players. No less impressive are the taut, diverse themes and voicings--the opening fanfare in "A Song Of Joy," the Spanish tinge in "Miss Ann," the harmonies redolent of Horace Silver in "The Creeper," the evocative bop balladry of "Now I Know." And don't miss the smart structures that take aim at the familiar patterns of theme-and-variations. "Just Have Fun" is a good example: the theme is stated in unison and in counterpoint, and the solo choruses are made up of sixteen, four, and eight bar exchanges. Here is an album that delivers more each time you listen. Here is a debut that jazz lovers can celebrate. --GARRY GIDDINS, from the liner notes.